Friday night and the fridge is empty. Dinner needs to be made. The kid is hanging around the kitchen wanting to ‘help’, while the husband wants something simple and non-fussy. But good, of course — it has to be good. What to do? What to do? Tucked away in a corner of the fridge, there is that radicchio left over from that salad I made, and some green garlic I picked up for a forgotten project. 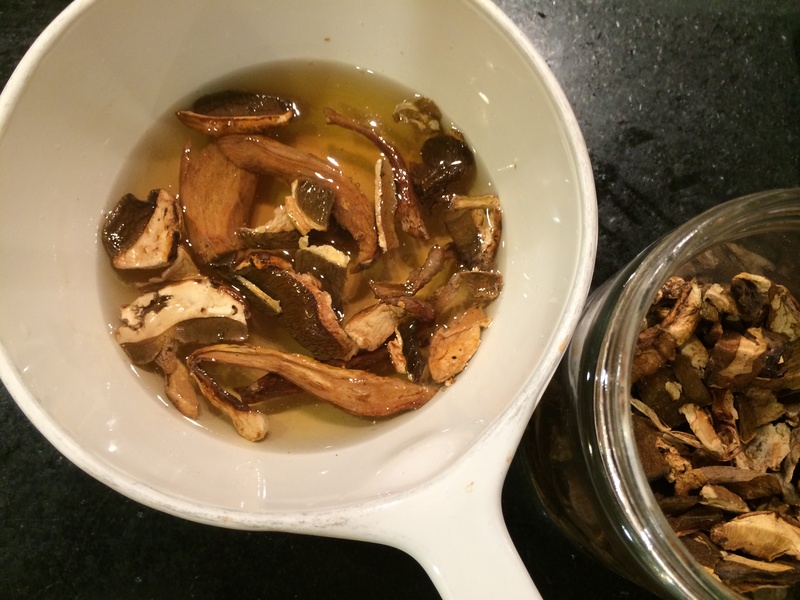 And of course there are some indestructibles hidden in the pantry, the dried mushrooms, the sundried tomatoes. The recipe invents itself! It’s time for the: ‘End-of-the-week Pasta’! Otherwise known as the: ‘Kitchen-sink Pasta’, or perhaps the ‘What-is-that?-throw-it-in Pasta’. Or maybe I want to call it the ‘Fresh Linguini with Radicchio and Slivered Almonds in a Porcini and Green Garlic Sauce’. What do you think? 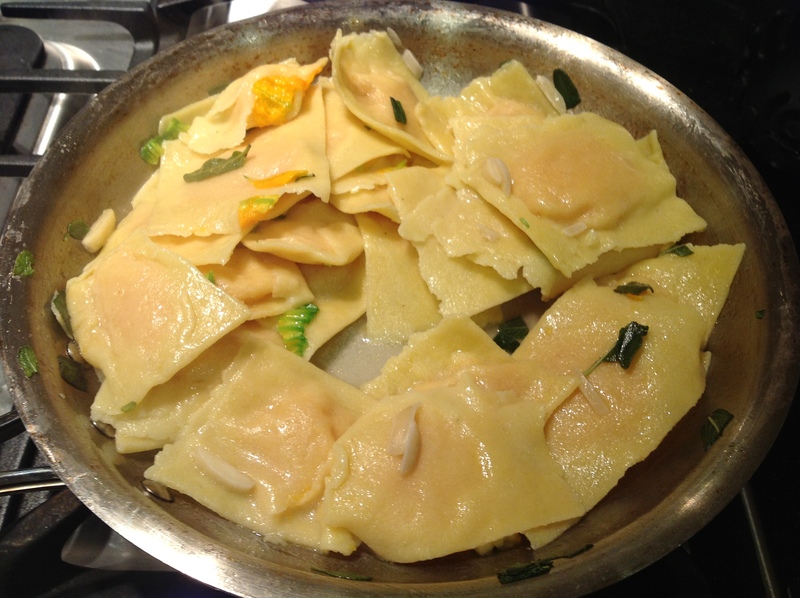 This recipe does not demand fresh homemade pasta, but it does politely ask for it. The delicacy of fresh pasta allows you to individually taste the many — um, disparate ingredients. 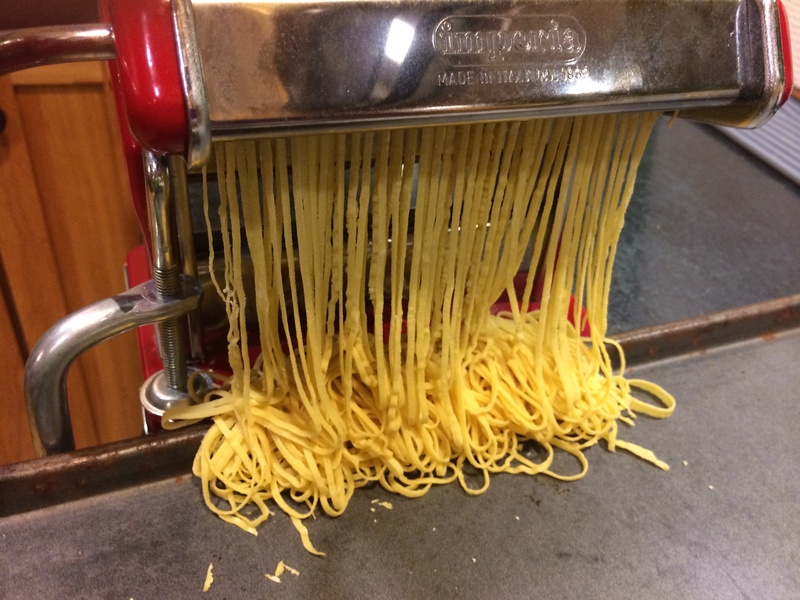 My daughter loves helping with cranking the pasta machine, and loves the curtain of pasta strands that get extruded, so that’s a plus (no homework on Friday evenings, need to keep her busy). For the fresh pasta look here — It’s nice to be kneaded. 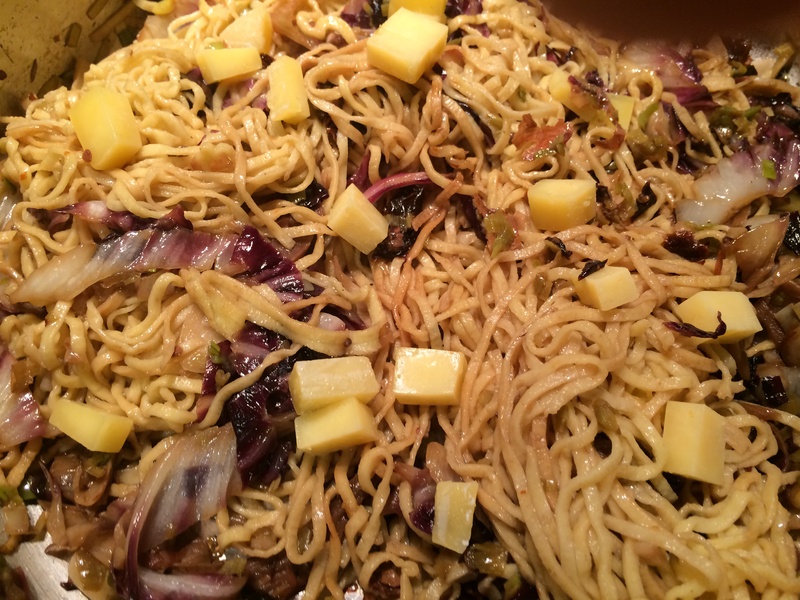 I also used cheddar cubes to finish, which formed nice gooey cheesiness around the strands. A note about salt. I didn’t add any except to the pasta water, because I had the anchovies. If you leave those out, please do add salt to taste. Here are some pictures to show the process. 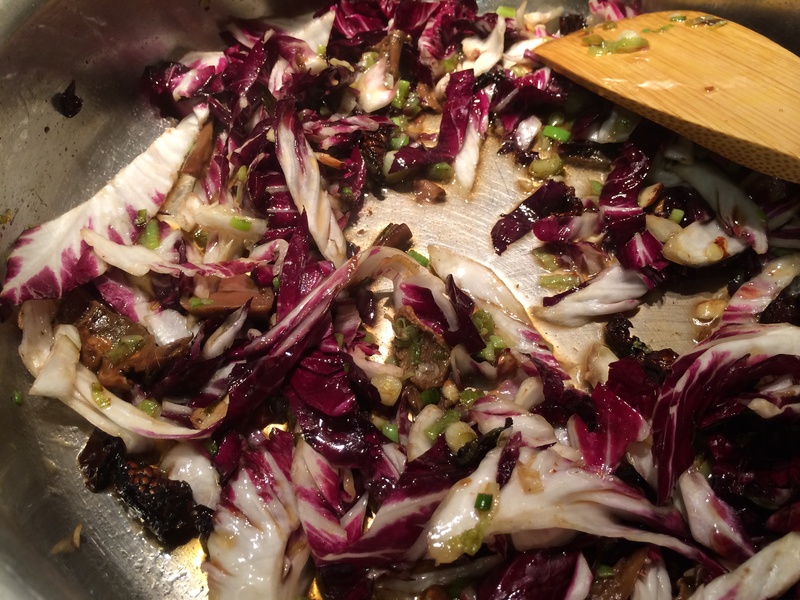 Slice the radicchio, the mushrooms, and the green garlic. Set salted water to boil for cooking the pasta (about 1/2 gallon). While the water is coming to a boil, prepare the sauce. Heat the olive oil in a wide pan on medium. Put in the green garlic and anchovies. The anchovies can be left whole because they will simply merge into the surroundings. 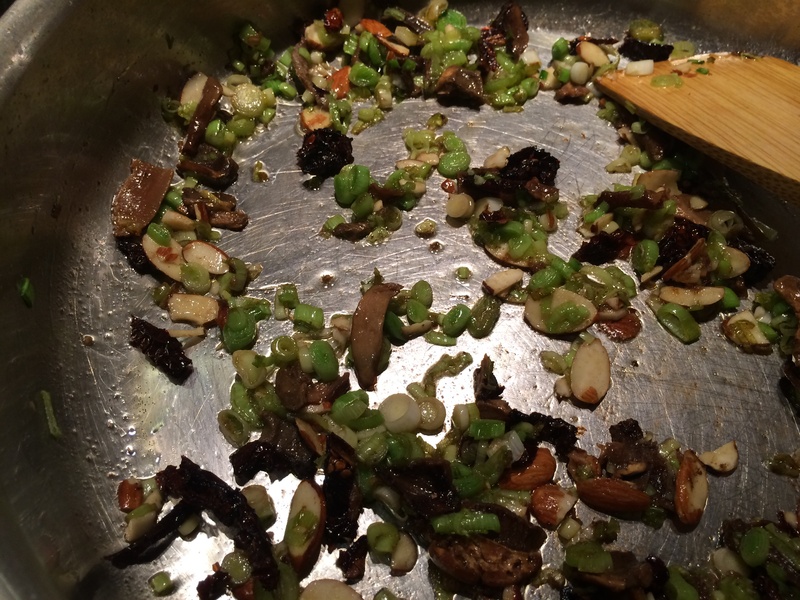 When they start to sizzle, put in the sliced porcini, the slivered almonds, and the sundried tomatoes. 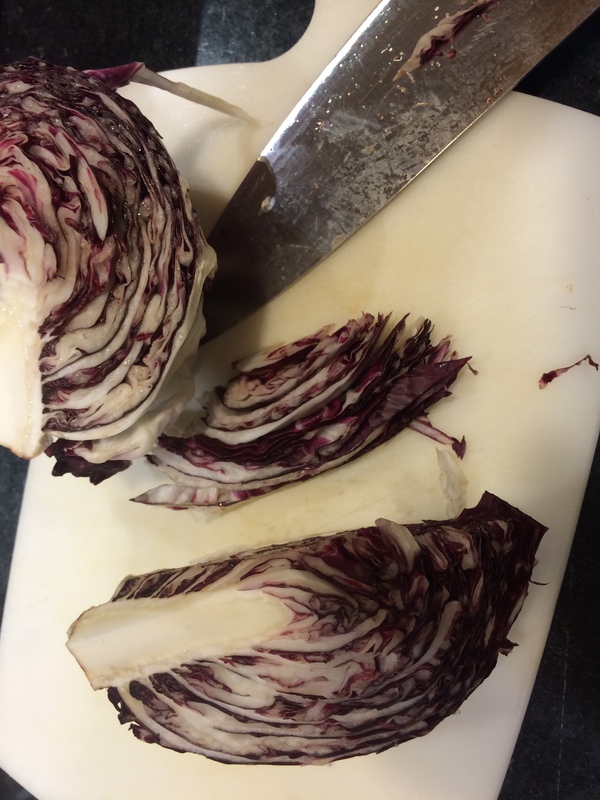 After a few minutes of cooking these, the radicchio can go in, just to wilt, it doesn’t need to cook long. Cover to keep warm and turn it off to wait for the pasta. Meanwhile the water will have come to a boil. The pasta will take only a few minutes if you used the fresh ones, otherwise follow directions on the box. Fish the pasta out and put into the prepared sauce with the addition of a few ladles of pasta water. Toss to combine. Put the cubes of cheddar on top and stir that in to melt incompletely. Yes, incompletely. I apologize for the sinister, Ludlumesque title. Really all I’m talking about is butternut squash ravioli — those pillow-soft — umm, pillows — made of pasta and filled with fillings. Stuffing things into dough is something that every culture seems to get up to eventually. In India we have parathas and samosas, in China they do the won tons, in Nepal and Tibet they have momos, in Latin America they have the pupusa, and of course we get the ravioli from Italy (just one of their many filled pastas). 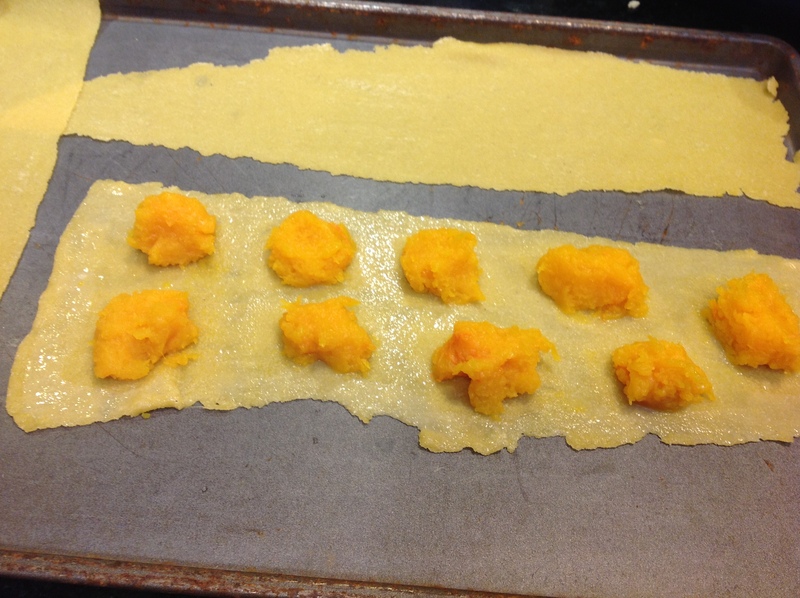 Butternut squash ravioli has been my husband’s favorite for years. He would always order it at Italian restaurants if it was available on the menu; that didn’t happen often enough, so we found a source of made raviolis at Rainbow Grocery and farmers markets. That source was not consistent either, so he coaxed me into getting out my pasta machine out from storage to attempt making it at home. The dough of course, is the same for any pasta shapes you might want to make; the recipe for the filling and the procedure follows. One thing to note is that this is a vegan filling, which is somewhat unusual. We have always sought out vegan fillings (not because we don’t eat dairy, we do) but because most fillings seem to be so full of cheese and creaminess that one can hardly taste the actual flavor of the stuff. 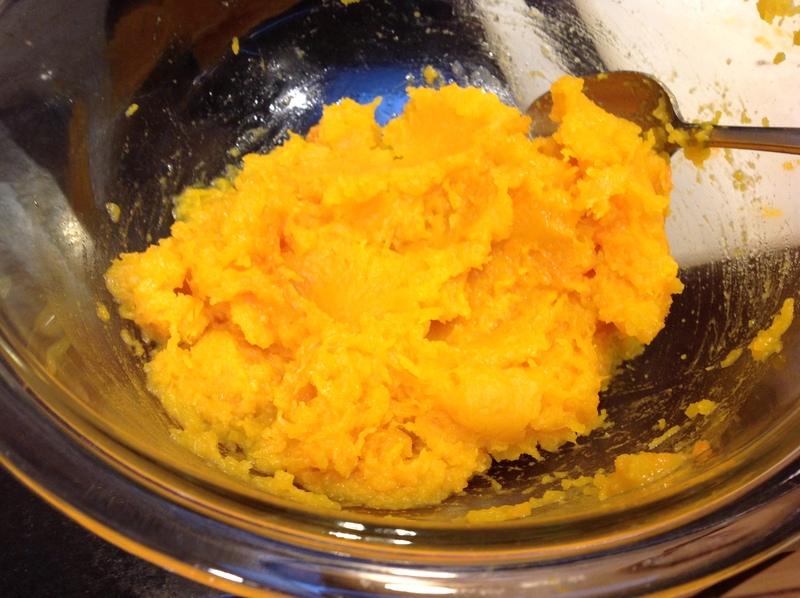 This one is chock full of butternut squash flavor. 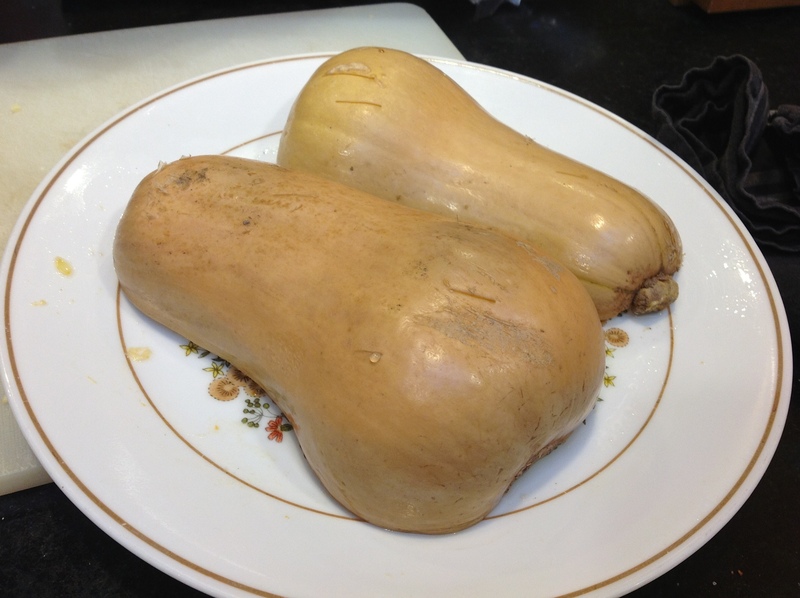 Cut the squash into halves lengthwise. Place it face-down on a plate, with a few tablespoons of water, and stick it in the microwave for 8 minutes or until done. Test it with a knife — it should as soft as butter. 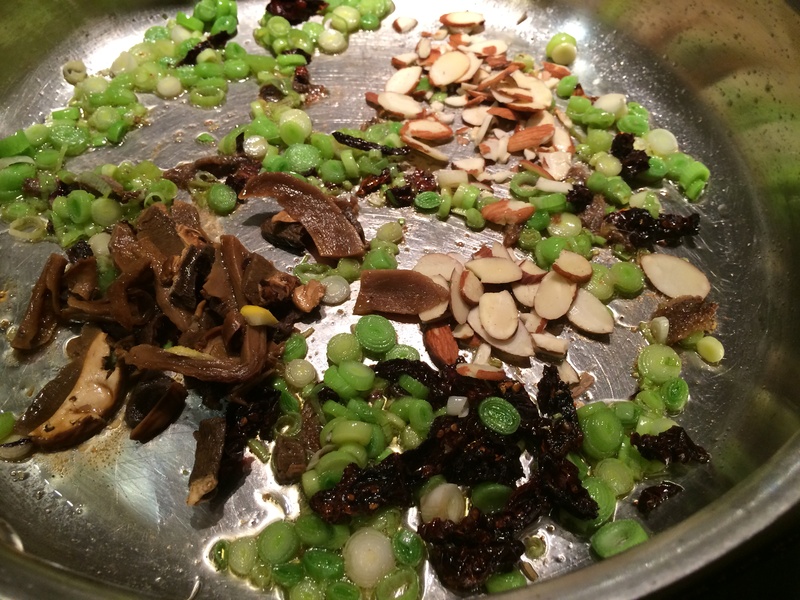 When it cools a little, it should be easy to scoop out the seeds to discard, and the flesh to save in a bowl. Mix in some salt and the olive oil, and whisk them in, which should have the effect of making the filling more luscious. Filling is done. 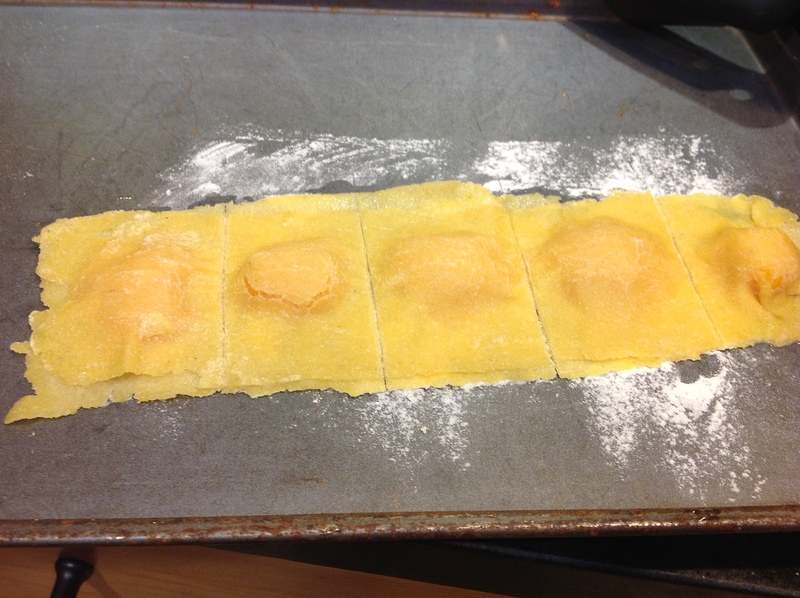 Now we construct the ravioli. Find two sheets of pasta that are roughly even in size. Lay out one (after dusting the surface with flour). Then place the filling in dots along the sheet, a teaspoon each, while leaving a lot of space around to stitch up the pillow seams, so to speak. Using some water to dip your finger in, carefully moisten the gaps in between the filling rounds. 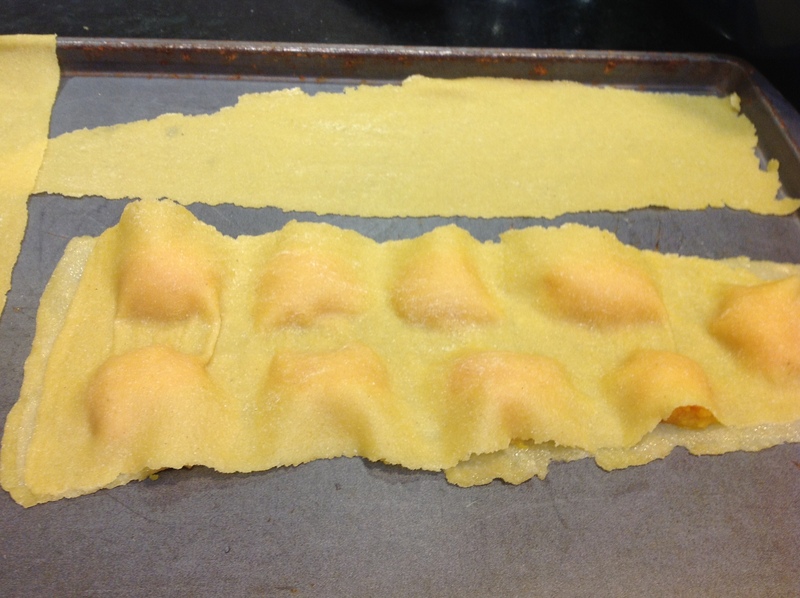 The other sheet of pasta gets laid carefully over to cover. Press down gently but firmly to stick to its brother sheet on the bottom, along the channels that you dampened with water. Try to squeeze out any air from the pocket. 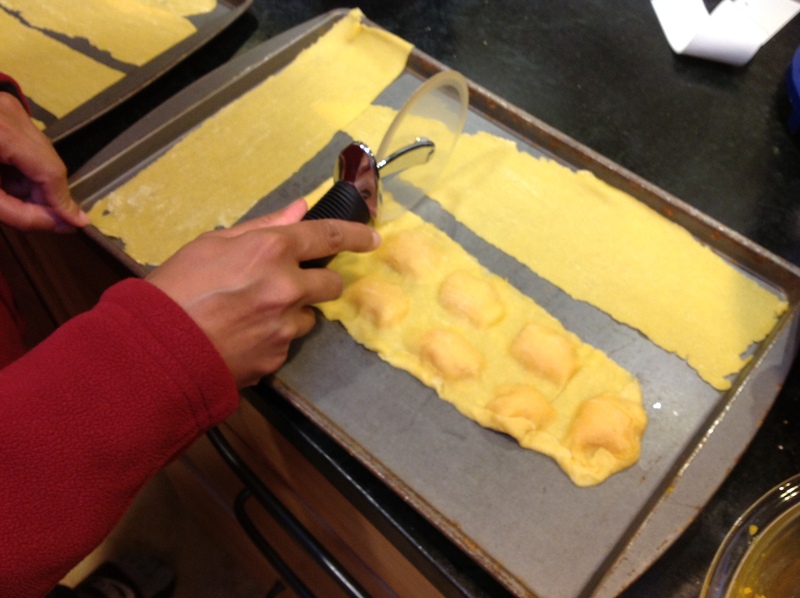 Now, using a pizza cutter if you have one, or a butter knife if you don’t, cut the ravioli into squares along the pillow seams. Keep dusting with flour as you remove the prepared squares to a plate. 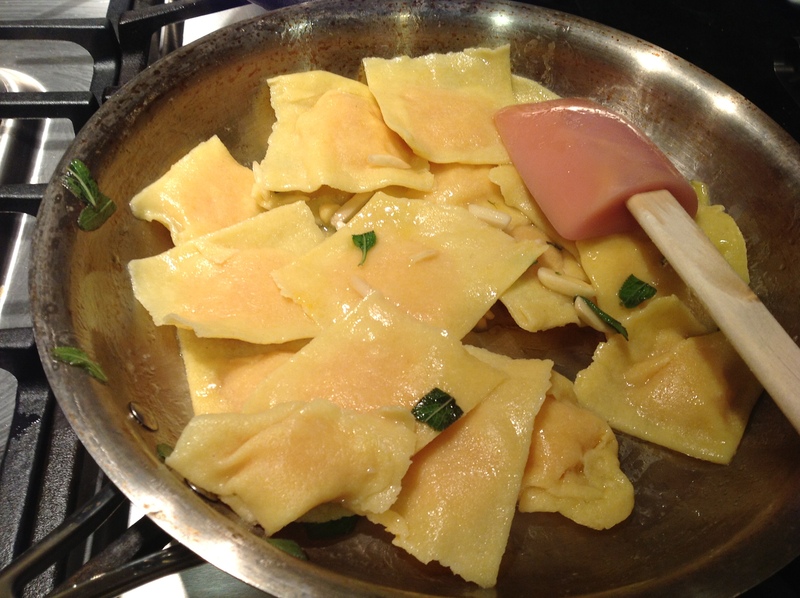 If you have some weird shapes left, don’t throw them away, I at any rate wrap filling into the scraps and fold over like a won ton, or find a few misshapen scraps to combine into a plausible ravioli. These are ready, now to cook them and the sauce. Set a big pot of water to boil with a teaspoon of salt. While that is coming to a boil, prepare the very simple sauce in a wide pan. 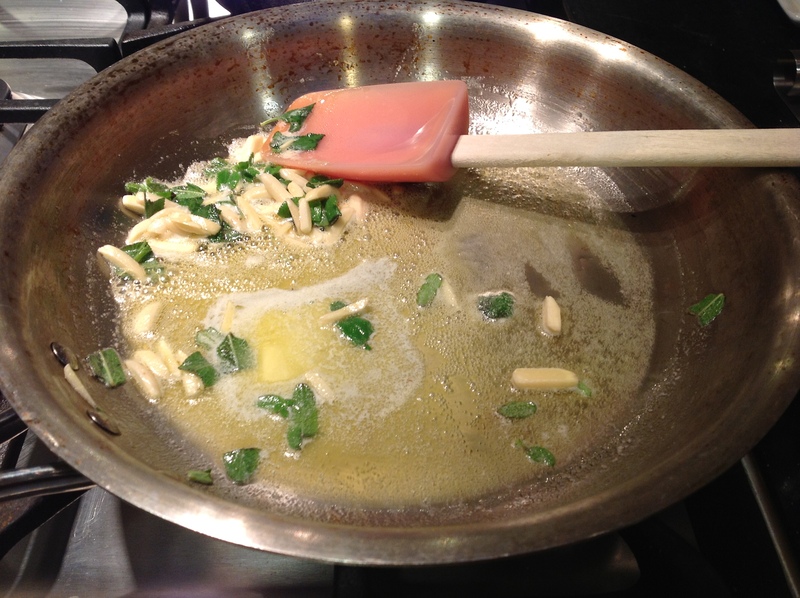 Heat up the butter; in it, gently saute the sage leaves and the slivered almonds. Let it simmer very gently. Once the water comes to a rolling boil, put in the raviolis (do not toss them in, or the hot water will toss back at you). They only need to cook for a few minutes, and you will know when they are done when they float up to the top. Remove them with a slotted spoon into the sauce, and add a few ladles of the pasta cooking water to make the sauce flowing. Stir, simmer additionally for a few minutes with the cover on, and they are ready. 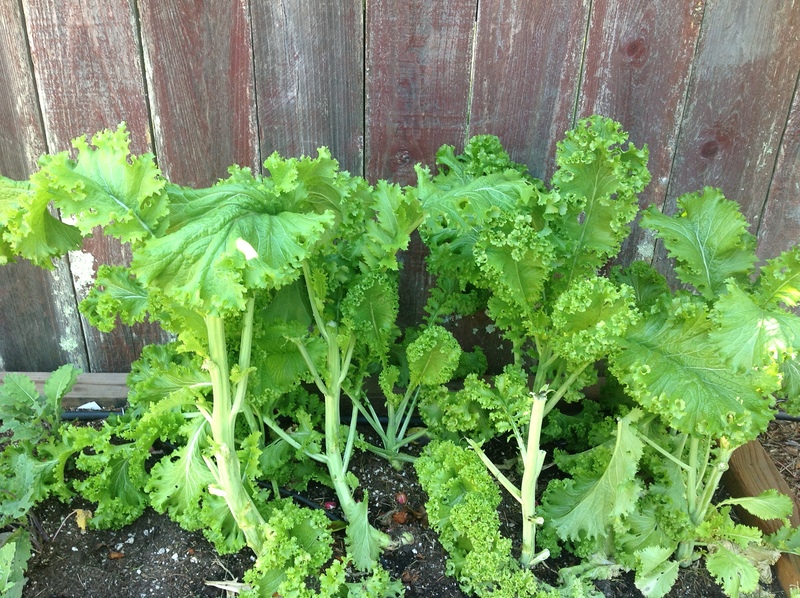 When we first brought our mustard seedlings home, they were petite and unassuming. Planted them in the ground, and given San Francisco’s freakishly warm weather, we soon had curly monsters threatening to swamp the house. Naturally we set about consuming them as fast as we could. Harvested an entire meal’s amount to make Punjab’s famous ‘sarson ka saag’, which means ‘greenish pulpy thing made out of mustard’. 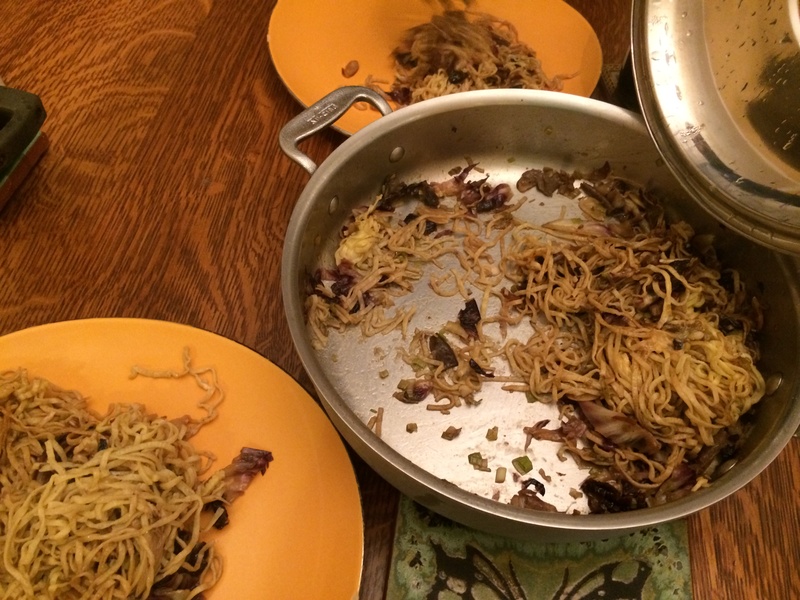 It was good, but made not a whit of difference in the amount of curly monsters in the garden. 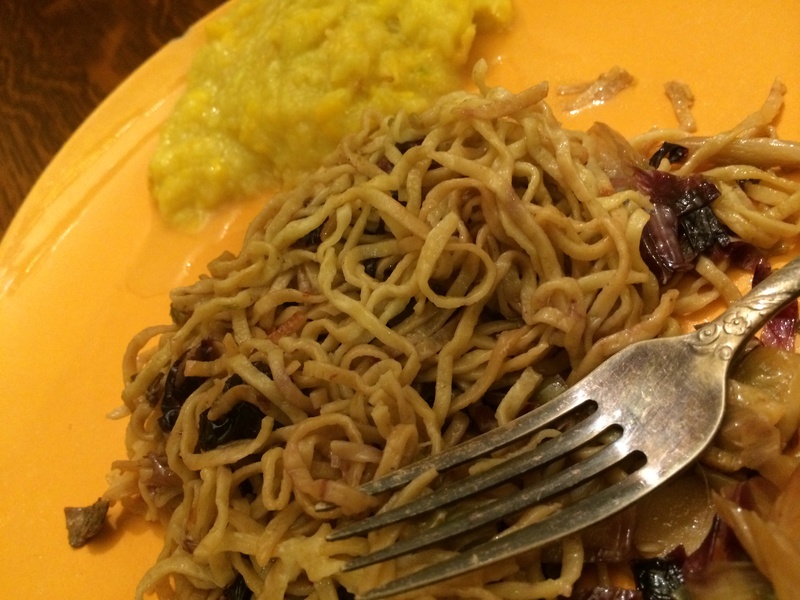 Soon we were eating sarson ka rice, sarson ka pasta, sarson ka…everything. On the way, I learnt an important lesson about cooking mustard greens that the Punjabi chefs learnt thousands of years ago. Unless you cook and puree the mustards, the curls in the leaves — which are quite tough, by the way — will interlock and will not separate, and you either get a mouthful of mustards all clumped together, or you get none at all. Pureeing after cooking makes them luscious and even. 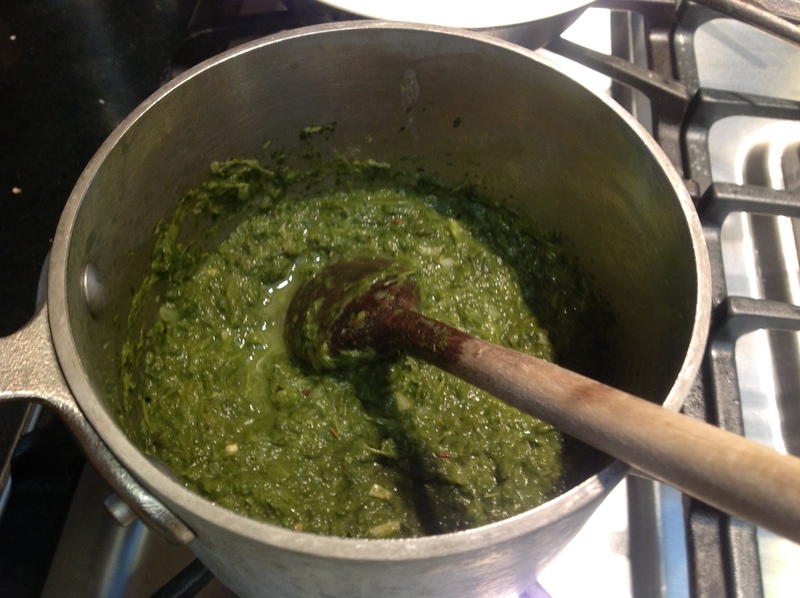 So here is the basic technique for the Punjabi sarson ka saag, and then my other variations. Step 1: is the most important:boil and puree. 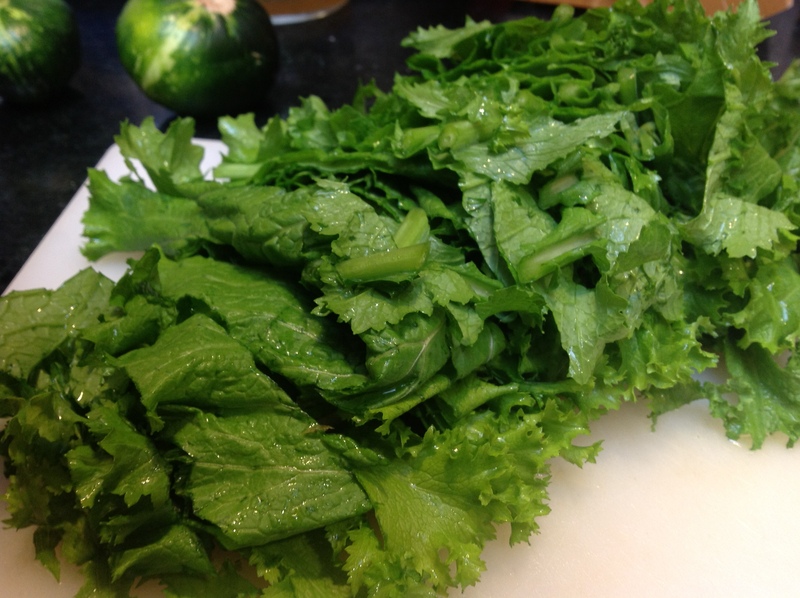 Rinse, roughly chop a bunch of mustard greens. Put them in a pot with a quarter cup water, salt, half an onion, roughly chopped, two green chilies, roughly chopped, and a quarter cup chopped cilantro. Bring to a boil, cover, simmer and cook for about fifteen minutes, or until the mustards are no longer bright green. 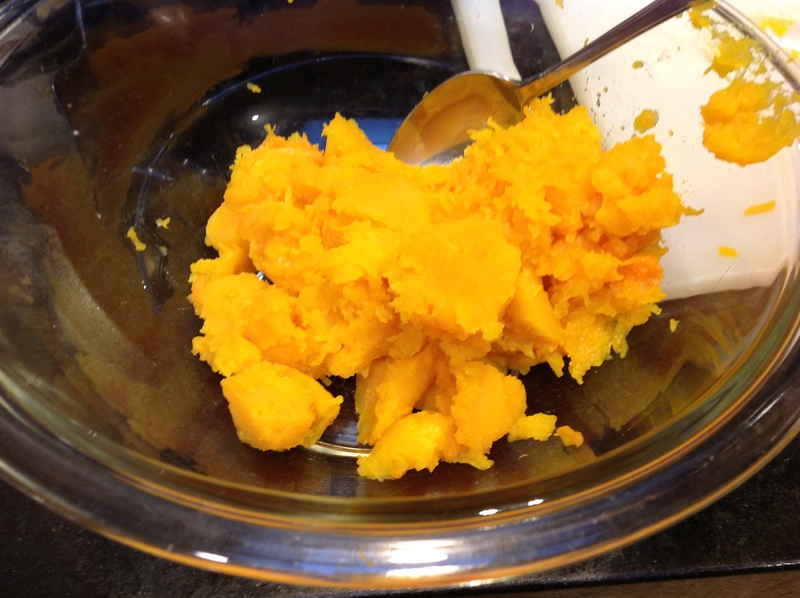 Cool for a few minutes and puree in a blender, although there is no need to make it completely smooth. I couldn’t tell you if every villager in Punjab uses this set of seasonings, but this is what I used, and it was good. I heated two tablespoons of ghee in a small thick bottomed pan on medium-high. 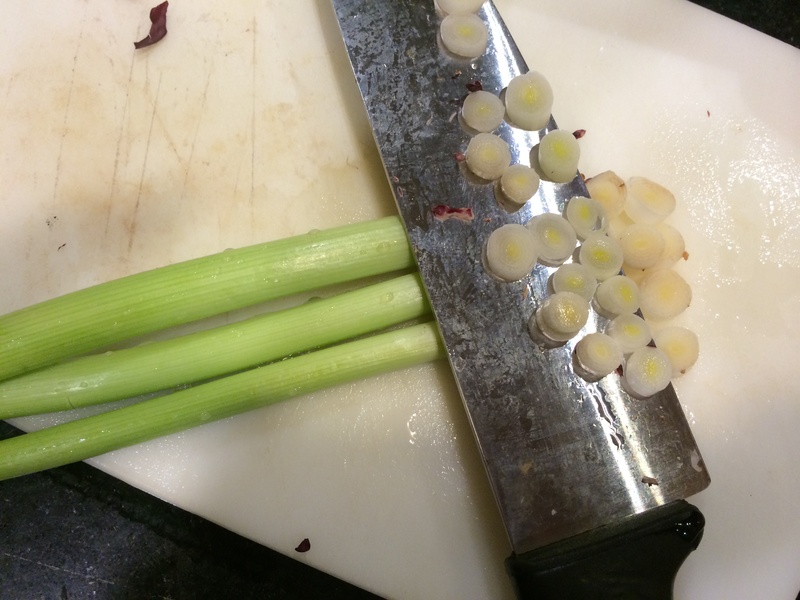 Then put in a teaspoon of cumin seeds and 3-4 cloves of garlic, minced. Also half a teaspoon or more of red chili powder. Once they sizzle and the garlic looks cooked (not browned), put in two tablespoons of besan (chickpea flour) and stir. I think the more typical ingredient here is cornmeal so if you have that, use a quarter cup of that instead. Allow the besan (or cornmeal) to roast in the oil for a few minutes. Then empty the seasoning into the mustard puree and stir. Check for salt and add more if needed. Simmer a little longer to meld the flavors and fully cook the besan. Sprinkle some lemon juice over the top (inauthentic ingredient alert). Serve with roti/chapati. Here I boiled the greens with just a quarter onion and some salt. After about fifteen minutes of simmering, I roughly pureed them in a blender. Keep it aside. Meanwhile, get a big pot of salted water to boil; once it boils, put in half a pound of bucatini (this is enough for a dinner for two). Wait till it is almost done to al dente, then fish out the pasta with a pasta spoon and put it into the greens along with a few good sized ladles of the pasta water. Use your judgment here — if the greens aren’t saucy enough, add a little more pasta water. Stir nicely to break up the clumps of mustards to combine with the pasta water and turn it into a sauce. Remember the sauce has to coat the pasta, not remain in clumps at the bottom. Stir to cover the pasta with the greens, cover the pot and simmer for just a minute or two. Turn off heat; pour some fresh XVOO on the top, and parmesan shavings if you like, and serve. This makes a wonderfully light green sauce for the pasta that looks as nutritious as it, in reality, is.